As announced by Google on December 11, 2018, Google Fusion Tables and the Fusion Tables API will be turned off on December 3, 2019. Some users may start to see errors in August 2019. Fusion Tables support will be removed from FME after the service has been shut down. For ways to migrate your data out of Google Fusion Tables using FME, see the blog post 7+ Google Fusion Tables Alternatives. Prior to FME Server 2012 SP2, the user had to request data from FME Server in order to receive it. With the new Notification service, users can subscribe to data and have information pushed to them when there is a change rather than pull it down themselves. The following demo utilizes FME Server to receive incident reports, determine who should get those messages based on their subscription options (e.g. area of interest) and then send alerts to the correct people. Email is used to confirm subscription, receive alerts and unsubscribe. 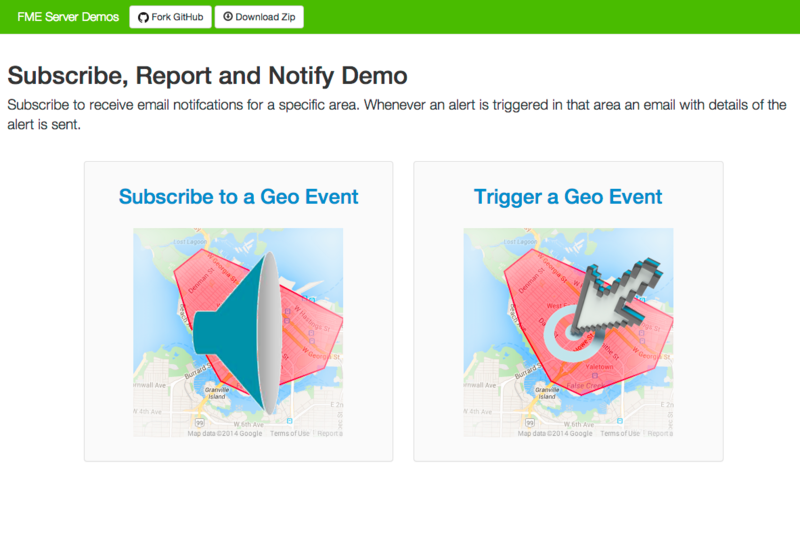 Although simple this demo is showing key functionality of the Notification Server, allowing people to subscribe to an AOI and then receive notifications when an event happens in that area. Crucially all of the logic running on FME Server is stored within Workspaces. That means it is very easy to configure this example to use your own datasets and business logic. subscription_request.fmw: Processes the JSON request that the subscription HTML web app processes when you click submit. A confirmation email is sent and the wkt is loaded into a Google Fusion table for visualization. subscription_confirm_email.fmw: Called when the user replies to the confirmation email. Updates Google Fusion table and sends the activation email out. subscription_delete.fmw : Unsubscribes the user. report_web_form.fmw: Called when the user generates an alert in the web application. Consumes the request and reprojects the point to lat/lng also takes into the account the buffer value set. notification_alert_generation.fmw: Called by report_web_form.fmw. Workspace consumes the request, creates geometry based on the point passed in, generates a Google Static map and sends an email out to everyone within the subscription area. Place the reporter.html, subscriber.html and style.css file on your web server.